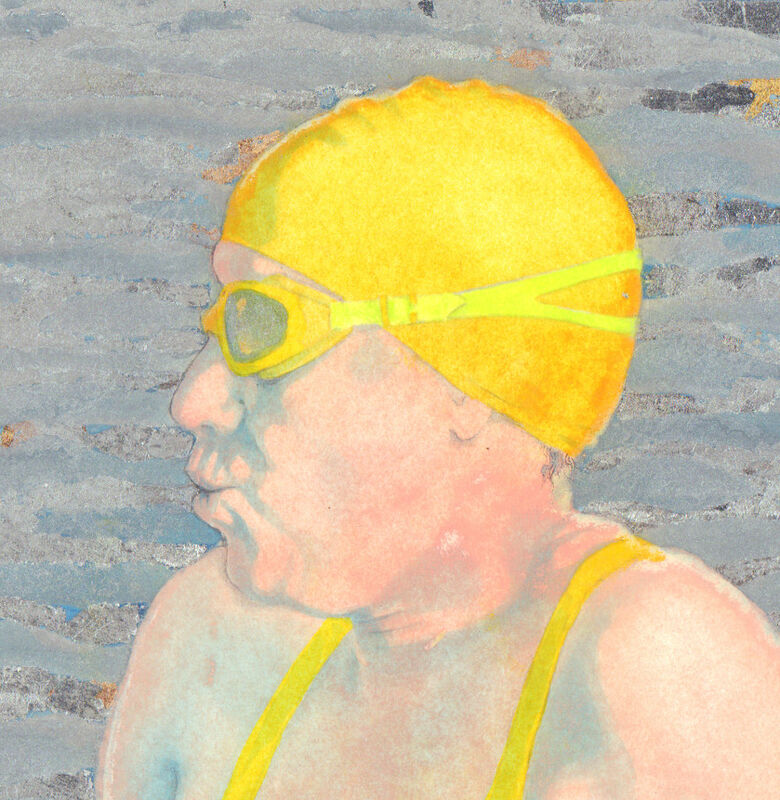 Not as flattering as my last paintings of swimmers, but I was trying to convey the feeling of the water, bright and icy. 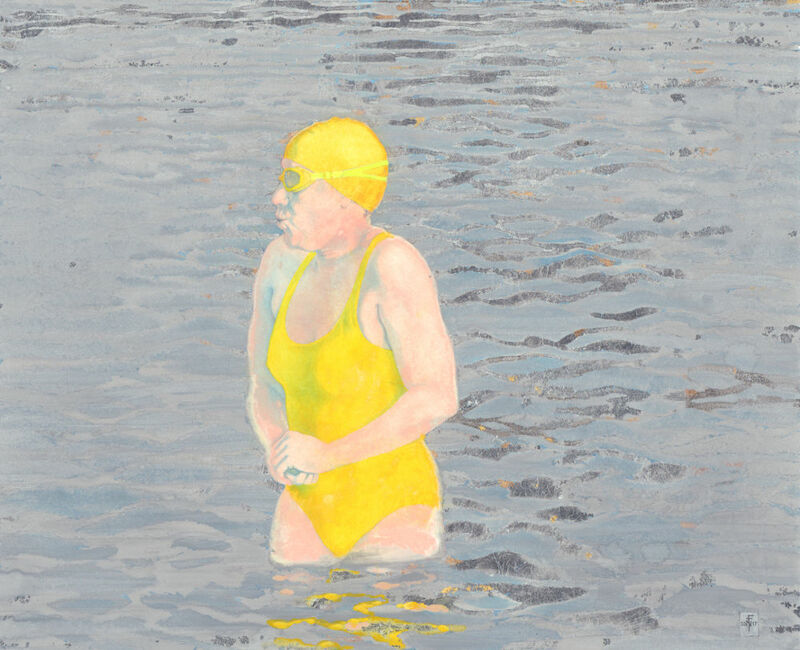 The photograph that I used for reference in this painting was taken on a day when the water was indeed 2.5°C. 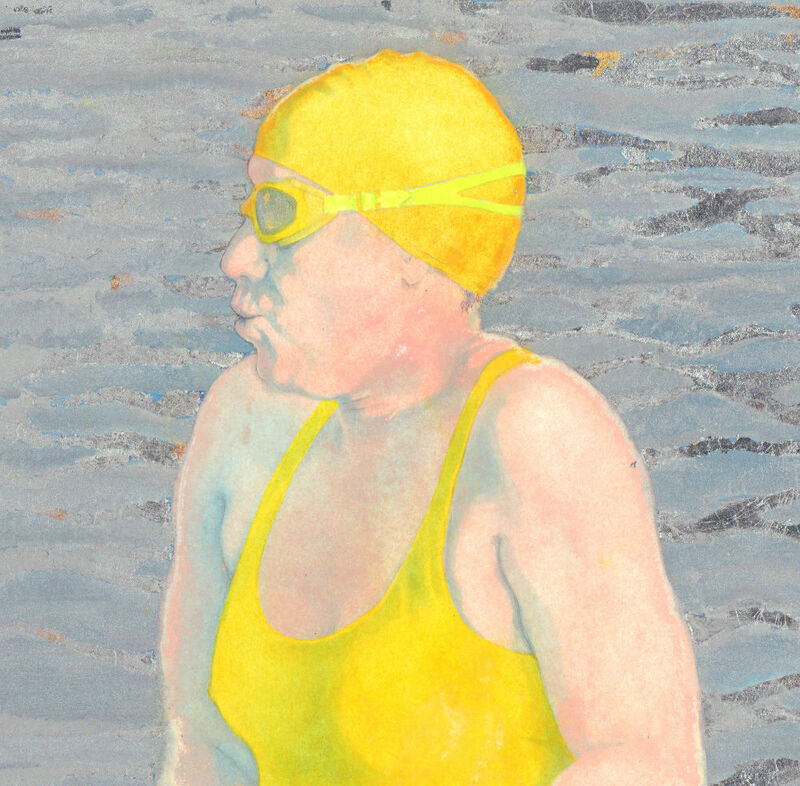 I’ve left the painting a little unfinished compared to what I would usually do – the patchiness of her pink skin, the remains of white paint around the edges that was actually a mask of white paint protecting the figure while I added the grey, all added to the feeling of rawness, so I left it like that. The piece is particularly difficult to photograph: what shows up as dark grey on a scanner is actually aluminium leaf (and a few shreds of gold and palladium leaf), and it catches the light. The grey paint also has mica powder added to it which gives it a lustre. Photographed at an angle – below – you can see the shine off the aluminium. I’ve also inexpertly taken a film clip of the light catching it. Having once been a goldsmith, I have to admit to a certain metals snobbery. Though aluminium was briefly – about the time of Napoleon – the latest big thing, it now seems something like sacrilege to use gold and aluminium leaf together. And it handles differently – it’s much thicker, so that you can actually pick it up with fingers, but it needs more stickiness to attach it to the paper. Gold sticks with the tiniest hint of stickiness, and brushes away where it’s not wanted. Aluminium tends to shred and pull off in pieces where it was supposed to be stuck. Which is how I came to be filling in the gaps with gold leaf, though I quite like this effect. But I could still get to like the aluminium leaf, it is very much shinier than palladium or white gold, and white gold would eventually tarnish, and it doesn’t cost a fortune to use this much. 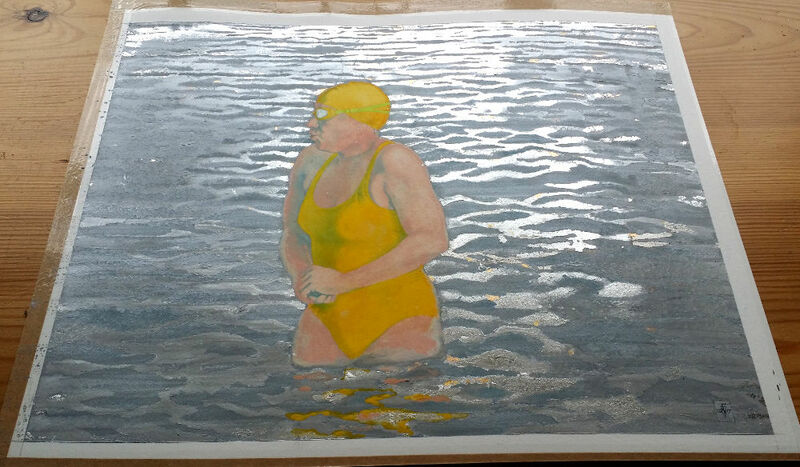 This entry was posted in Media, Metal leaf, Paint, swimming and tagged aluminium leaf, aluminium leaf on paper, art, gilding, gold leaf on paper, gouache, ice swimming, painting, watercolour on March 31, 2017 by Nancy Farmer. I’m not going in that water! I really like your choices in this picture. I think the aluminium really works. She just looks so cold! Great job!